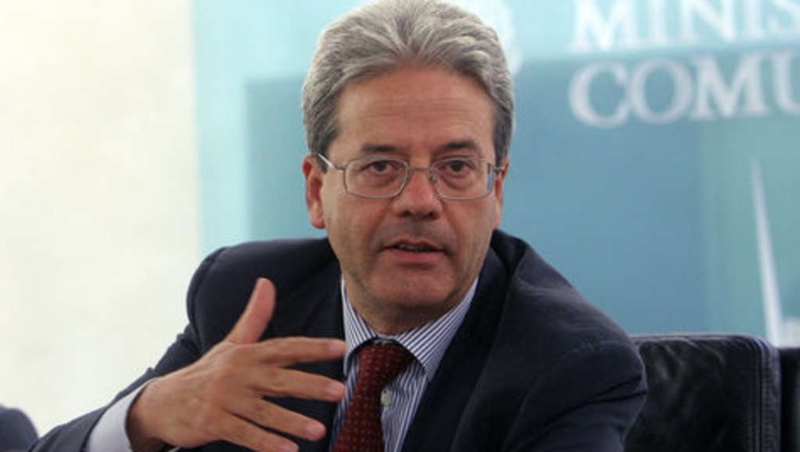 Italian Minister of Foreign Affairs and International Cooperation, Paolo Gentiloni will visit Azerbaijan in coming months. Gentiloni spoke about his visit at the 4th session of the Intergovernmental Commission on Economic Cooperation between Italy and Azerbaijan, held in Rome on June 13, Italian media reported. The minister said Italy relies on Azerbaijan in the South Caucasus and noted that from a geopolitical point of view. “Azerbaijan has a strategic position and great economic potential, it is a key country linking Europe with Asia, as well as Italy's partner,” he said. Speaking about the visits of Azerbaijan's President Ilham Aliyev to Italy in 2014 and 2015, as well as the mutual visits, Gentiloni said the Italian side wants that there were more official visits. The minister also touched upon the importance of the Trans Adriatic Pipeline (TAP) project in strengthening the Italian-Azerbaijani partnership. He said the project is strategically important for Italy's economy and the Azerbaijani gas will be supplied to Italy via this pipeline in 2020. The country is the largest supplier of oil to Italy, and with the launch of the Southern Gas Corridor will supply Shah Deniz gas to this country. Earlier this month some 18 Italian companies attended the 23rd International Caspian Oil&Gas exhibition in Baku for the first time. The Italian participation was represented by solid and better structured companies focused for foreign markets, confirming their willingness to cooperate with the Azerbaijani companies. Gentiloni went on to add that the trade turnover between Italy and Azerbaijan amounted to five billion euros in 2015 and Azerbaijan's demand for Italian products is increasing. Italy wants to increase its exports to Azerbaijan, he added. Over the past few years, Italy remains the main trade partner of Azerbaijan. Azerbaijan’s State Statistics Committee statistics show that the trade turnover with Italy in January-April 2016 amounted to $567.54 million and some 78.14 percent of the total turnover fell to the export of Azerbaijani products to Italy. The economic cooperation between the two countries shouldn't be limited to the energy sector, according to the minister, as the sides enjoy opportunities for cooperation in various fields. Speaking about the importance of relations in cultural sphere, Gentiloni emphasized the attention paid by the Azerbaijani side, in particular, by the Heydar Aliyev Foundation to this sphere. The foreign minister also noted that Italy also must make efforts for restoring peace and stability in the Caucasus and for a constructive and fruitful cooperation between Azerbaijan and the EU. Touching upon hte Armenia-Azerbaijan Nagorno-Karabakh conflict, he added that Italy supports the efforts of Germany, which chairs the OSCE, for the settlement of the conflict. The minister assured that in case of Italy's election as the OSCE Chair in 2018, the country will make every effort to resolve the conflict. The 4th session of the Intergovernmental Commission on Economic Cooperation was held with participation of Azerbaijan's delegation, led by the country's energy minister and the Commission's co-chairman Natig Aliyev, and various state structures representing the country. Along with the Commission's session, an Azerbaijani-Italian business forum was held the same day in Rome with participation of the two countries' leading companies. Italy, being the largest importer of Azerbaijani goods, enjoys good relations with the country and export from Italy to Azerbaijan is also growing year by year. Italy, is very interested in investing in the country, and according to experts, logistics, alternative energy, hardware, ecology, jewelry, construction, agriculture and agricultural complex, certification and food industry are the most attracting fields for Italian businessmen.